OXFORD, Miss. 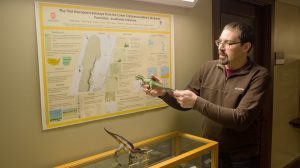 – A University of Mississippigeologist’s collaboration with researchers at the University of Arkansas has yielded the discovery and digital preservation of the first tracks of carnivorous dinosaurs ever found in Arkansas. Brian Platt, assistant professor of geology and geological engineering at UM, was lead author of “LiDAR-based characterization and conservation of the first theropod dinosaur trackways from Arkansas, USA,” an article in the Jan. 2 edition of the journal Public Library of Science ONE. 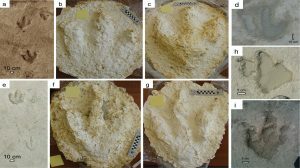 He was contacted by colleagues at UA after miners discovered the large, three-toed prints in a gypsum quarry near Nashville in 2011. The footprints were preserved in a layer of rock that the mine had been blasting through to reach deposits of gypsum, a widely distributed mineral frequently used as a soil amendment and in making wallboard and plaster of Paris. The miners generously agreed to delay blasting so the team could examine the site before it was destroyed. Because time was of the essence, the team applied for a special grant through the National Science Foundation that is designed for time-sensitive projects, called a RAPID grant. The University of Arkansas received RAPID funding for $10,000, and the UA vice provost for research and economic development and the J. William Fulbright College of Arts and Sciences each provided matching grants, making the combined total funding $30,000. To preserve the site, colleagues from the UA Center for Advanced Spatial Technologies used a method of laser scanning called LiDAR to create a digital replica of the site. LiDAR, which stands for light detection and ranging, uses a pulsed laser to measure distances to the earth in tiny increments. Researchers used LiDAR because traditional methods would have taken too long. Platt’s 2014 travel was funded by a Southeastern Conference Traveling Faculty Grant, which the conference awards each year to enable SEC faculty members to collaborate with peers at other conference institutions. The award, which was supplemented with funds from the UM Department of Geology and Geological Engineering, allowed him to spend a week at UA over spring break to collect the measurements he needed. The tracks have since been destroyed, but the scans allowed the team of researchers to study the tracks and determine that they were made by Acrocanthosaurus, a large, carnivorous dinosaur. The findings extended the known range of the dinosaur 56 miles east, to what was the western shore of an ancient sea. The site had two different sized tracks, suggesting both adult and younger animals lived in the area about 113 million years ago, during the Cretaceous Period. It also contained tracks made by sauropods, long-necked plant-eating dinosaurs. “Now we know more about the ancient ecosystem, e.g., both sauropods and theropods lived together in the same environment,” Platt said. “On a broader scale, the rocks that contain the footprints tell us that the environment was once a large tidal flat or evaporative coastal basin that experienced very dry conditions. Platt earned a bachelor’s degree from Bloomsburg University of Pennsylvania and master’s and doctoral degrees in geology from the University of Kansas. Before coming to Ole Miss, he worked for an environmental consulting firm in New Jersey and as an instructor and lecturer for the geology department at the University of Kansas. After completing his doctorate, he spent a year working as a post-doctoral researcher at the Kansas Geological Survey. His research integrates sedimentary geology and paleontology. Researchers also created a detailed, publicly accessible online map of the site and the tracks. The digital reconstruction of the trackway site can be viewed at the website for the Center for Advanced Spatial Technologies. To read the PLOS ONE article, visit http://journals.plos.org/plosone/article?id=10.1371/journal.pone.0190527.